Located to the right of the Original Shrine. The mortal remains of Schoenstatt members who offered their lives for the growth of the movement and its work and lived exemplary lives are buried here. The Joseph Engling (1898-1918) stone stands in the middle. 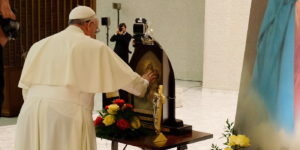 He is a symbol for Joseph Engling’s loyalty to Schoenstatt’s ideals, particularly in his love for Mary, his attachment to the shrine, his apostolic force and his child-like attachment to his spiritual father, Fr. Kentenich. During his time as a soldier (1916-1918), he strived to serve his companions selflessly, in this way giving life to his personal ideal: “to be all things to all men, exclusive property of the Blessed Virgin.” He offered his life to our Blessed Mother for the needs of the Movement. Our Lady accepted his offer near Cambrai, several days before the end of the First World War. The process for his canonisation was opened on 1 May 1948, and positively closed at the diocesan level in 2008; in the same year, the second phase of the process was opened in Rome. In 1934, a group of students and seminarians brought back the remains of Max Brunner (1897-1917) and Hans Wormer (1897-1917) from France. Both were members of the first Schoenstatt group and were killed on the battle front. In the military cemeteries of the First World War, the graves of the allied soldiers were marked by white crosses while the German soldiers’ graves bore black crosses, hence the colour of these crosses. destroy the devil’s power, O Victress, grant us peace. The Augustinian sisters’ cemetery used to be here. The “popular and pilgrim movement” began developing from 1934 onwards. The Blessed Mother wants to attract many hearts to her Son through Schoenstatt. “A clear Marian spirituality is the best way to build a deep and widespread popular movement,” the Founder once said. In 1937 the area was cleared for use by the pilgrims and the first church (today the Pallottines’ Church) was built behind the Old House. The Stations of the Cross can be prayed by moving around Pilgrim Place. Located directly in front of the Original Shrine. Built over the Augustinian sisters’ convent, it is one of Schoenstatt’s oldest buildings dating back to c. 1652-1662. It was completely renovated towards the end of the 1980s. Over time, it served as a boarding school, college, retreat and meeting house. The Institute of the Sisters of Mary was founded here in 1926. Today it forms the sacristy for the Original Shrine. It also has a small chapel, meeting room, several rooms for guests and a small shop selling religious items. It is property of the Pallottine Fathers. On the southern side of the Shrine, in the centre, is the Faculty of Theology (Theologische Hochschule) belonging to the Pallottine Fathers. In 1908, construction on a new house of studies began. Fr. Kentenich worked there between 1912 and 1919 as the students’ spiritual director. In 1945, the house of studies became the higher school of theology and has been known as the Faculty of Theology since 1933. Situated on the northern side of the Shrine is House St. Michael belonging to the Pallottine Fathers, and the Pallottines’ Youth Center. The only tower (strongly reinforced) of the old medieval convent to have survived can be seen. The House of the Diocesan Priests’ Apostolic Federation can be reached by following the footpath behind the Old House that leads into Vallendar. The house has more than 100 years of history. The Schoenstatt Diocesan Priests bought it in 1950. Fr. Kentenich gave many retreats and conferences here. He was living there in the week before his death. Today, the house is open to other groups and pilgrims to Schoenstatt. This house is special because of the “Father Kentenich Room” containing some memorable items, such as the chasubles that Father used to wear and the Pilgrim Mother picture John Pozzobon gave to Fr. Kentenich as a gift in 1968. The House is surrounded by a beautiful park with a well. This shrine was blessed in 1992. There is Mass every morning at 7:00am and on Monday, Wednesday and Saturday there is also a Mass at 19:00. In 2001, the Press Office moved in to where the old goldsmith used to be, next to Marienau. Father Kentenich visited the house several times. The Press Office, where the schoenstatt.de website is produced, also houses the Third International Auxilliary of the Rosary Campaign. The Press Office is an international meeting place for the entire Schoenstatt Family where friendships are formed and experiences shared. A stone with a bronze inscription attached to it stands several metres from Marienau. It is the “farewell point,” as the youth call it. According to reports, Fr. Kentenich used to accompany the first boys who were returning to their military duties to this point, where he would say his goodbyes. The plaque records the date of Fr. Kentenich’s last goodbye to Joseph Engling. The secretariat for the Apostolic Men’s Federation can be found at the foot of the hill. The house is also used to accommodate visitors to Schoenstatt. The house can be reached by following the path up Mount Schoenstatt or by climbing the stairway alongside the Schoenstatt-Verlag bookshop. It was blessed on 15 August 1928 by the archbishop of Trier. Fr. Kentenich and his closest collaborators lived there and trained the “central” core of the Movement. Fr. Kentenich left from the Bundesheim when he handed himself over at the prison in Koblenz on 20 September 1941. The house was used as a field hospital during World War II. Fr. Kentenich also left from this house when he was sent into exile to Milwaukee in 1951. It continued to operate as the “central place for the Movement” until 1964. It was then named “Pallotti House.” It was renamed “Covenant House” (Bundesheim) in 1998 and has been made available to Schoenstatt since then. This house belongs to the Secular Institute of the Brothers of Mary, founded in Dachau by Fr. Kentenich on 16 July 1942. As consecrated lay men living in the secular world, they are also at the service of the Schoenstatt men’s branches. The house was inaugurated in 1976. It hosts an exposition on Mario Hiriart. Crowns, tabernacles, statues and many religious items bearing the characteristic mark of Schoenstatt are manufactured in the workshop alongside the house. In 1965, Fr. Kentenich returned to Schoenstatt and worked to re-establish a strong popular movement. The Pilgrims’ Information and the Pilgrim house, built in 1974, serves this purpose. To the right of the entrance, the dining hall and a shop selling religious items can be found. The first and second floors consist of rooms to accommodate those who want to stay and spend the night in Schoenstatt. On the other side of the Pilgrim House, in the opposite direction from the Original Shrine, is an open air picnic area. Following a small pathway alongside the stream, there are pleasant paths along which to meditate and pray. On the hill pilgrims can pray follow and pray the Stations of the Cross. The amphitheatre can hold about 15,000 pilgrims. It was used in 1985 for the international centennial celebration of Fr. Kentenich’s birth. In 2005, it was the centre of the Schoenstatt Youth Festival. From 1985 to 1998 this was a large tent with a capacity for 2,000 people. It was put up in 1985 for the centenary celebration of Fr. Kentenich’s birth. In 1999, a new wooden and more resistant church was built in its place. Masses (in German) are celebrated there during summer each day at 10:30 AM (except Monday), on Sunday and Feastdays also at 6:00 PM. The monthly Covenant Mass is celebrated here each 18th of the month at 7:30 PM. House belonging to the Girls’ Youth and Accommodation. The name “Sonnenau” was taken from the “Home Song” (found in Heavenwards, the prayer book written by Fr. Kentenich) and means “sunlit meadow”. The house was blessed on the feast of Pentecost in 1958. Its foundation stone describes the ideals of the Girls’ Youth: a crown and three crosses accompanied by the inscription VS-RTA-PPC (Ver Sacrum-Regina Ter Admirabilis-Pro Patria Consumor). The house was renovated and extended in 1999 and is currently also used to accommodate pilgrims. Schönfels is a smaller house used to accommodate visitors. The ground floor houses the Schönstatt Verlag bookshop belonging to the Sisters of Mary. The original Apostolic Women’s Federation, from which the Institute of the Sisters of Mary and the Institute of our Lady of Schoenstatt were founded, continues to function on the express wishes of Fr. Kentenich who provided a unique space for these consecrated women who were searching for an organization that was not bound by the legal attachments of an institute. On Pentecost Sunday 1967, the founder blessed the shrine and put the house’s foundation stone in place. The Apostolic Women’s Federation offers a small display on Gertrud von Bullion (1891-1930) in this house. She and her cousin, Marie Christmann, were the first women to consecrate themselves to Our Lady of Schoenstatt on 8 December 1920. The process for her beatification was opened in 1991. Requests for a guided visit can be made at House Mariengart.